Completely rewritten in 2010 to cover upgrading and fixing Windows 7! 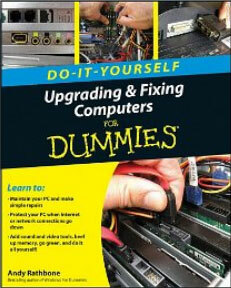 Upgrading and Fixing Computers Do-It-Yourself For Dummies takes a step-by-step approach that walks you through some pretty scary computer tasks. To keep you on track, nearly every step includes an illustration, whether it’s a screenshot from Windows 7, Windows XP, or a photograph of how to install or replace a computer part. Designed for people who’d rather save money by doing repairs themselves, the book covers fixes, upgrades, and repairs for netbooks, laptops, and desktop computers. The book not only walks you through each installation job, but it explains how to find the most compatible part with the biggest bang for your buck. Click the book’s cover to visit its link on Amazon, where you may browse through it online before buying it. Browse the complete Table of Contents online at Amazon. A few errors inevitably creep into every book. These errors have appeared in Upgrading and Fixing Do It Yourself For Dummies. As soon as they’re reported, I make sure they’re fixed in the book’s next printing. Joyce, if your computer won’t turn on, then this post about diagnosing a sick computer might help you isolate the culprit. My guess is that it’s your power supply, a fairly easy fix covered in this edition of Upgrading and Fixing PCs: Do It Yourself For Dummies. Glad to hear you’re enjoying the books, Wendy!